Relax the Back franchise business opportunity. Free Relax the Back business franchise information. It's no secret that good health offers great rewards, both personally and professionally. Everywhere you look, today's ever-increasing commitment to individual health and wellness is transforming our lifestyles, along with the landscape of business. 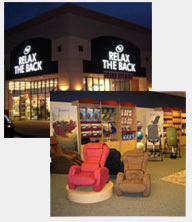 But what you might not know is that, for two decades, one retailer has been at the forefront of this change for the better: we're Relax the Back, and with 100+ stores across the U.S. and Canada, we are North America's largest specialty retailer of ergonomic and comfort products. We're now looking to open more locations, to increase the highly-respected position we already occupy in what has become a multi-million dollar industry. We need qualified entrepreneurs to join us and share in the success. If you've ever been serious about investing in a franchise, you owe it to yourself to consider the strengths of Relax the Back. 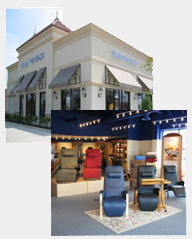 The high-end products we offer from office chairs to Zero Gravity recliners, from fitness equipment to Tempur-Pedic® mattresses have received an overwhelmingly positive response from our clients and the healthcare community, and we proudly share an affiliate program with the medical professionals at SpineUniverse.com. Our operations have been featured in publications including the Wall Street Journal, and on network TV shows like Oprah Winfrey. And the fact that many franchisees have been with us for over a decade, own multiple stores, prove that a partnership with us is one that really works. Retail experience is not necessary. Our training program comprehensively covers all aspects of opening and operating a Relax the Back store. To learn more about the Relax the Back franchise opportunity, simply complete the form below.